Before, After or In-Between? Study Puts Another '?' Behind the Widely Accepted 'Cardio After Weights' Paradigm. Image 1 (rippedfitness.com): As of late everyone picks on gals who believe they would get bulky, when they train with weights... I wonder, when people finally start picking on big, but chubby guys who still try to justify their laziness with the "conditioning work induces muscle loss" myth, when they are guzzling their sugary weight gainers. I know that I am probably one of the few people with a bias towards lifting weight and high intensity interval training who does not discard the merits of steady state aerobics (LISS) as a third pillar of the exercise part of physical culture. In that I am however well aware that we all have only so much time to spare for exercise - although I believe each and everyone of us would be able to carve out another hour everyday, if we just streamlined our schedules and threw out some useless Internet surfing or TV watching, but this is another issue... it may thus be necessary or at least desirable for many of us, if we could combine strength and LISS sessions into a single session. Personally, I have been doing that for years and after some initial experimentation I have, for the most time, relied on the broscientific recommendation to do LISS after workouts (when I could not do it separately). Cardio? Ok... but when? Before, after or in-between? The recent publication of a study on the post-exercise response to concurrent endurance and resistance training published in the Journal of Sports Science and Medicine does yet make me question if there may not be better ways to combine weight lifting and light intensity steady state cardio training. To elicit whether you'd better walk on the treadmill at 60% of your HRmax before or after your weight lifting workout and whether there may not be an even better third protocol that would involve jumping back ond forth from the treadmill to the bench Andrea Di Blasio and her colleagues from the G. d’Annunzio University of Chieti-Pescara in Italy recruited 13 young previously untrained women (mean age 24.40y; BMI 21.28 kg/m²). On three different occasions, each of the participants, who underwent an extensive initial fitness test and had been required to follow identical nutrition protocols before each of the three testing sessions, performed all three of the endurance / resistance training protocols, i.e. ...in random order. Resting energy expenditure, VO2, ventialtion, respiratory frequency, proportion of oxygen in the expired air were collected for 30 minutes via continuous indirect calorimetry (FitMate Pro, Cosmed, Roma, Italy) with the subjects in total rest and in a reclined position in a standardized and quiet room (please keep that in mind! We are NOT looking at intra-exercise energy expenditure, but what happens, when you head home or shower!) according to a standardized experimentally validated protocol (Compher. 2006). This is an interesting result, because it suggests that the hitherto certainly unappreciated alternation of strength and LISS training within one exercise session appears to elicit those post-exercise increases in EE, VO2 and ventilation, that are necessary to support the re-synthesis of adenosine triphosphate (ATP) / creatine phosphate (PCr), to replenish glycogen and oxygen stores, to propel lactate removal and circulation (Børsheim. 2003). It stands do reason that all these processes are energy intensive. To (1) quantify all of them in kcal (I wonder how long you could survive if you ate kcal instead of foods and how your mitochondria would function if they burned kcal instead of nutrients) and (2) subsume them under the misleading term "excess post-exercise oxygen consumption" (EPOC) and judge the "optimal" training regimen by its effect on EPOC is yet short-sighted, not just because "EPOC comprises only 6-15% of the net total oxygen cost of the exercise" (LaForgia. 2006), but also because this practice implies that the total or relative (as fat) amount of energy you expend in the immediate vicinity of a workout was the main determinant of its effects on your metabolic health and physique. F*** EPOC, the fat burning zone and the calories in vs. calories out hypothesis! Figure 3: Figure 3: Changes of key enzymes envolved in the phosphorylation of key enzymes in the protein synthetic cascade in response to endurance (E) and combined endurance and resistance (E+R) training (calculated based on Sahlin. 2011; originally posted in "Resistance After Endurance Training Increases Mitochondrial Biogenesis & Protein Synthesis and Ramps Up Fat Metabolism"). That the results of the study at hand do yet still speak in favor of the mixed-mode AERT protocol - at least as long as your main intention is to perform a relatively light full-body conditioning workout at least 3x times a week - is thus not that it yielded the highest post-exercise energy expenditure, but that it did that at the (relatively) lowest rate of perceived exertion (see figure 2, left) and provided the greatest VO2 stimulus to initiate those beneficial metabolic adaptation which won't just reduce the huffing and puffing on subsequent training sessions, but will also help you build a bigger metabolic engine, that's going to keep you lean and help you shed more fat in the future. Apropos "metabolic engine", those of you who have been around for more than a couple of weeks, should actually remember my a post from November 15, 2011, in which I already discussed that adding strength to endurance training can turn even a 60-min cycling workout into a tree-trunk leg builder (see figure 3). In conjunction with the study at hand, which is the first I know of that compared "cardio first", "cardio second" and "cardio in-between", directly, the results of the 2011 Sahlin study, which employed a true hypertrophy specific pyramid-style leg training after 60min of cycling (without a "hypertrophy first" control, though) do suggest that it may be about time to re-evaluate the bro-scientific standard protocol of "strength, first", "cardio, second" without the long overcome mantra of "you got to work out in the fat burning zone" in the back of your head. Interestingly, enough, Yardley et al. have only recently reported that "doing cardio first" can make type I diabetics go hypo (Yardley. 2012). Though this may sound scary at first, it would suggest that, in healthy people, the expression of the energy sensor AMPK, as well as the the mitochondria building, fat browning protein PGC-alpha (cf. "If a High Fat Diet was a Pill, the Lay Press Would Celebrate it as Exercise in a Pill!") is probably higher and all the beneficial downstream effects on metabolic health and body composition more pronounced (as always you can of course also argue otherwise - if you want to get hightened leptin levels down, you'd better do it the exact other way around; cf. "Greater Reduction in Leptin With Cardio After Weights"). You may certainly argue that you would gain more strength without doing any cardio... still, the average O-lifting heavy weight look is probably not what many of you are training for, right? And when you think about it from a physiological perspective it would only appear logical that you better do your cardio first, lift second and add a ~5min cool-down to leave the gym before your protein synthesis peaks / begins to decline, than experience just that during a 45min LISS session after your workouts. In this respect, even the "equipment hopping" of the AERT sessions, may have it's merit for advanced trainees. While it may certainly not be optimal to "bulk", switching back and forth from cardio to strength training could be a viable alternative for people whose main goal is to maintain the muscle mass while improving their conditioning - particularly when it is combined with short HIIT sessions 5-10min, followed by a short cool-down done twice before say chest and arms (e.g. HIIT > Chest > HIIT > Arms). Børsheim E, Bahr R. Effect of exercise intensity, duration and mode on post-exercise oxygen consumption. Sports Med. 2003;33(14):1037-60. Compher C, Frankenfield D, Keim N, Roth-Yousey L; Evidence Analysis Working Group. Best practice methods to apply to measurement of resting metabolic rate in adults: a systematic review. J Am Diet Assoc. 2006 Jun;106(6):881-903. 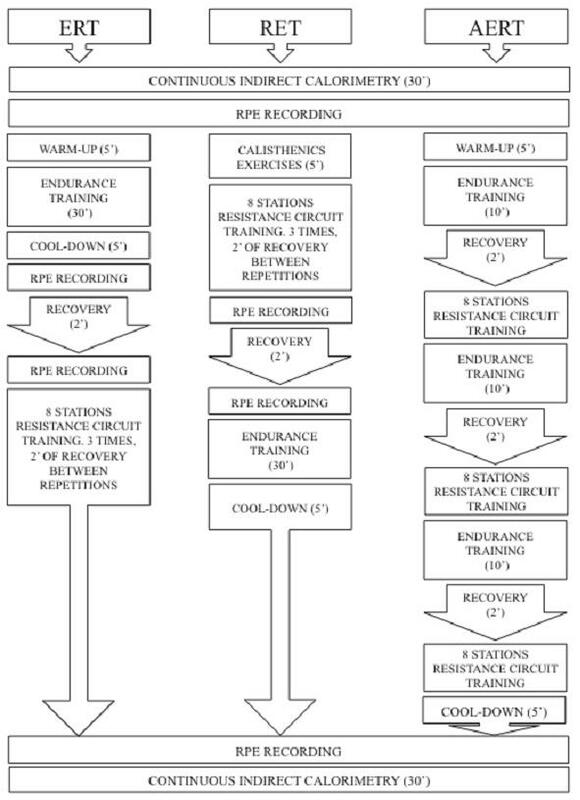 Di Blasio A, Gemello E, Di Iorio A, Di Giacinto G, Celso T, Di Renzo D, Sablone A., Ripari P. Order effects of concurrent endurance and resistance training on post-exercise response of non-trained women. Journal of Sports Science and Medicine. 2012 Aug; 11:393-39. LaForgia J, Withers RT, Gore CJ. Effects of exercise intensity and duration on the excess post-exercise oxygen consumption. J Sports Sci. 2006 Dec;24(12):1247-64.